Thursday Night Football between the Denver Broncos and Arizona Cardinals wasn’t billed as one of the better mid-week games of the season. It certainly lived up to that hype, with Denver coming out on top in blowout fashion, 45-10. While the two-win Broncos saved their season by blowing out an inferior Cardinals team, we learned a whole heck of a lot about Arizona. More than anything, it seems that offensive coordinator Mike McCoy’s future with the organization is up in the air after another brutal performance. For the Broncos, the stars came to play. Emmanuel Sanders accounted for two first quarter touchdowns. Meanwhile, Von Miller did his thing. Here are the biggest winners and losers from Denver’s 35-point blowout win over the now 1-6 Cardinals. Sanders had done well connecting with new quarterback Case Keenum through the first six weeks, catching 40-of-54 targets for 501 yards and two touchdowns. Those are some real nice numbers right there. But what he did against Arizona on Thursday added a much-needed layer to this otherwise dormant offense. Not only did Sanders haul in a 64-yard touchdown, he threw a 28-yard score to rookie Courtland Sutton in the first half. These two big plays pretty much put the Cardinals to rest before halftime. They are going to be needed if Vance Joseph and Co. hope to get back into the AFC Playoff picture heading into the midway point of the season. To many, it’s astonishing that McCoy has already found himself on the hot seat after just six games as the Cardinals’ offensive coordinator. For those of you wondering why, there’s no reason to look beyond his horrible performance calling plays Thursday night. Too often, McCoy put Josh Rosen in positions to fail. It led to two first half interceptions and a blowout loss. But it’s a lot more than that. McCoy still has absolutely no idea how to utilize Pro Bowl running back David Johnson. One example on Thursday was a called run up the middle on third-and-5. That’s not Johnson’s strength. Get him out on the boundaries. Don’t ask him to pick up five yards between the tackles. In any event, McCoy’s Cardinals put up 10 points, 223 yards and 14 first downs in the loss. He’s now as good as gone. Just ask Wikipedia. In a game that saw pretty much every other member of the Cardinals quit after two quarters, this future Hall of Famer cornerback was still balling out in the desert. With his team down 35-3 in the third quarter, Peterson intercepted a Case Keenum pass. He read the route perfectly as if he were the intended receiver. It ultimately led to the Cardinals scoring their only touchdown of the game. Cardinals owner Michael Bidwell might have shot down Peterson trade rumors leading up to Thursday’s game. But there’s a whole plethora of contending teams that would be interested in the still-great cornerback. His performance for an otherwise awful Cards team Thursday magnified that to a T.
Neither of the two first quarter interceptions Rosen threw can be blamed solely on him. The first pick-six was a result of a tipped pass at the line. The second interception saw the Cardinals’ receiver break off his route. Either way, Rosen himself grew frustrated as the game moved forward Thursday night. 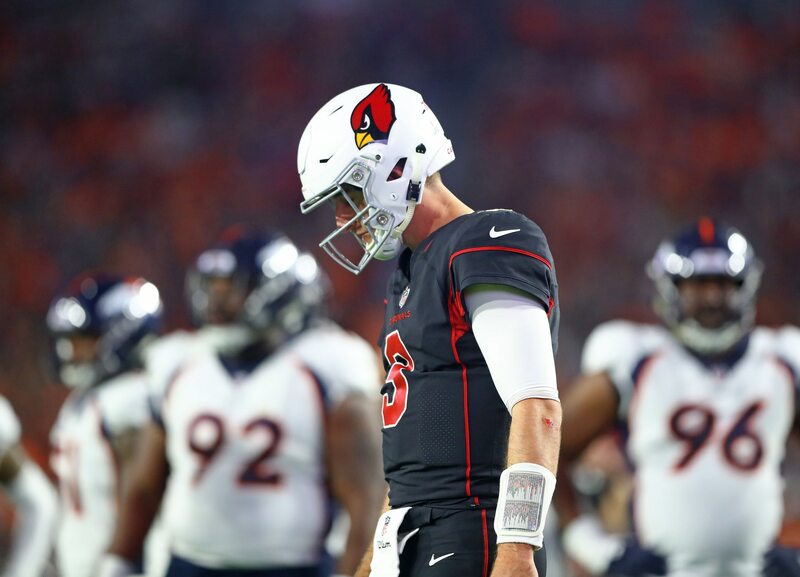 This certainly isn’t what the Cardinals or their fans want to see from a rookie quarterback with less than a full handful of starts under his belt. Rosen’s career will not be defined by what he does as a rookie. That being said, it’s important that his confidence doesn’t take a hit. After a five-turnover performance on Thursday, said confidence can’t be too high. This veteran linebacker had been seen as a pretty good starter over the past two seasons. Nothing spectacular. Instead, someone that could come in and be a stopgap option while other youngsters grew into the role. That’s changed to an extend in Davis’ fifth NFL season. He entered Week 7 having recorded 40 tackles and three quarterback hits through six games. Almost immediately, Davis made his presence known. It came on this pick-six of Josh Rosen following a batted pass at the line by Derek Wolfe. Right place, right time. Davis continued his excellent play throughout the evening, recording a combined 10 tackles and two passes defended. That could be huge for Denver moving forward. If we’re going to blame McCoy for his lack of ability as Arizona’s offensive coordinator, we have to blame the man that hired him. Wilks’ experience is on the defensive side of the ball. So it made sense for him to bring in an experienced offensive coordinator. But given how poorly McCoy performed in that role with the Broncos last season, hindsight tells us it was a bad hire. That’s evident through seven games. More than this, Wilks just looks in so far over his head it’s not even funny. His defensive scheme continues to leave a lot to be desired. By relying on McCoy, his offense could end up being one of the worst in modern NFL history. This certainly is looking like a one-and-done tenure for Wilks in the desert. This former Super Bowl MVP talked a pretty big game leading up to Thursday’s must-win outing against the Cardinals. Boy, did he back it up. Miller consistently pressured Rosen throughout the first two-plus quarters, only to come away with one quarterback hit. But his ability and perseverance paid off in the third quarter. With Arizona facing a third-and-4 in an attempt to make a game of this, Miller strip-sacked Rosen. Just a couple plays later, Phillip Lindsay would score on a run from 28 yards out to give the Broncos a 42-10 lead and pretty much end the night in Arizona. For good measure, he added another strip-sack of Rosen late in the fourth quarter. Talk about a dominant performance. It’s sad to see what has been an illustrious career come to an end in the fashion we are seeing with Fitzgerald. Heck, even his father knows that this version of the Cardinals doesn’t give the future Hall of Famer much chance at being competitive as his career comes to a culmination. Despite having scored the 111th touchdown of his career Thursday evening, Fitzgerald caught just 4-of-8 passes from Josh Rosen. He might not be the same player as we’ve seen in the past. But he still offers something. Unfortunately, the Cardinals’ coaching staff has not found a way to use it. And with Arizona now at 1-6 on the season, Fitzgerald’s distinguished career is on the verge of ending with a whimper. Among the most-disappointing aspect of Denver’s slow start to the season has been its defense. That’s one of the reasons defensive coordinator Joe Woods finds himself on the bot seat. The good news? This unit absolutely came to play on Thursday. That included a former Pro Bowler in Chris Harris returning a Josh Rosen interception for Denver’s second defensive score of the first quarter. Harris also added in four tackles and two more passes defended. One of the best cover guys in the NFL over the past several years, it now looks like the veteran has returned to form. Those who actually decided to show up at State Farm Stadium in Arizona were given absolutely nothing to cheer for. At 1-5 on the season heading into this game, things have been bad for the Cardinals. But it was taken to a whole new level in this one. Two Josh Rosen interceptions were returned for touchdowns before fans even made their way back from a beer run at the concessions. From there, most of these fans probably wished they just continued drinking. There’s really nothing good we can say about this performance. The play calling was horrible, Rosen himself was clearly frustrated. And in the end, it resulted in a 45-10 loss for the home team. Sadly, Cardinals fans have four more dates with infamy before the season comes to an end.